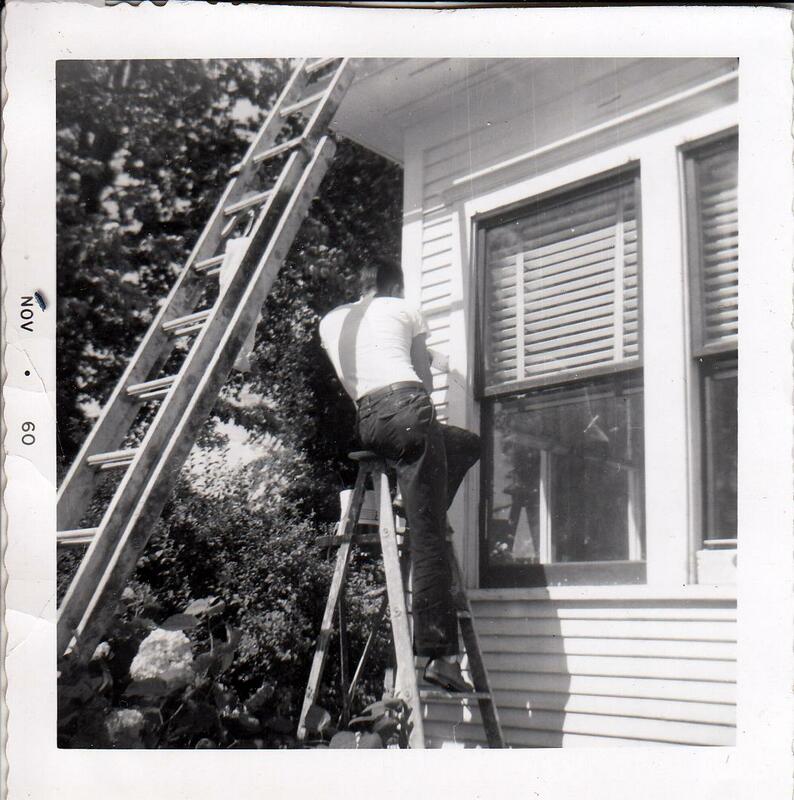 Jack painting his Grandparent's house in 1960. As I've mentioned here once or twice before, I correspond with Jack. 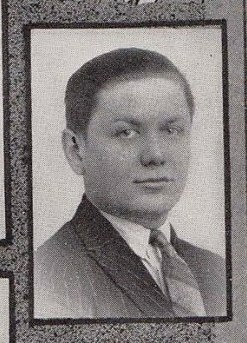 He is the 80 year old grandson of the original owners of our house. He is a wealth of information and I love hearing his stories of spending time in this house and neighborhood. Mr. Bell once built a boat in his basement. (The basement of that house is rather large with tall ceilings and plenty of space to work.) He worked hard building that boat and when it was finally finished, it was too large to exit the house using the doors. It's a boat after all. So, he had to excavate a portion of the basement/foundation and remove it that way. Quite an undertaking for a boat! He named the boat "Buddy" when he was done. Isn't that an awesome piece of history? So sweet, too! This story that Jack told me came to my mind again when I saw today's furniture flip. 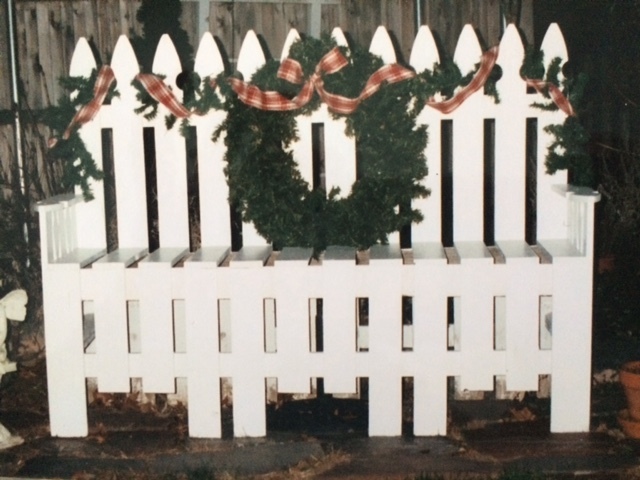 Our very talented furniture flipper, Diane Kelly of DK Fabrics, located in Barrington, R.I., was quick to act when her friend dismantled a well worn picket fence. Diane snatched up three sections of it and took them home. Let's take a look at this fantastic "new use for an old object". Very nice! It's amazing what one can do with a piece that had been headed to the landfill. Fantastic rescue! You can see more of Diane's work on her DK Fabrics website and on her Facebook page. She is an amazing upholsterer, too. Thanks so much Diane for sharing your awesome Furniture Flip! Dear readers, have you submitted your furniture flip yet? Whatcha waiting for? Email me before/after pics and plenty of details to furnitureflippin@gmail.com . 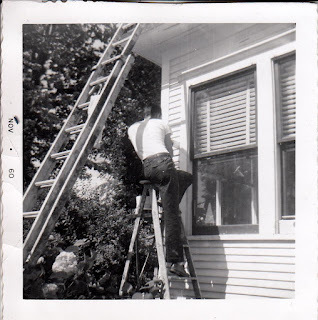 Oh, that picture of Jack painting his grandparent's house in 1960? He likes to let me know that he has painted this house twice in his lifetime. We are tied! Because I've helped paint this house twice in my lifetime, too! Thank goodness for siding. I don't like painting houses.